It looks like we’re now in the middle of the featured‐snippet‐geddon that “SEO astrologists” predicted more than 3 years ago. Google is actively rolling out featured snippets for a wide variety of search queries because they want to serve quicker answers to people. 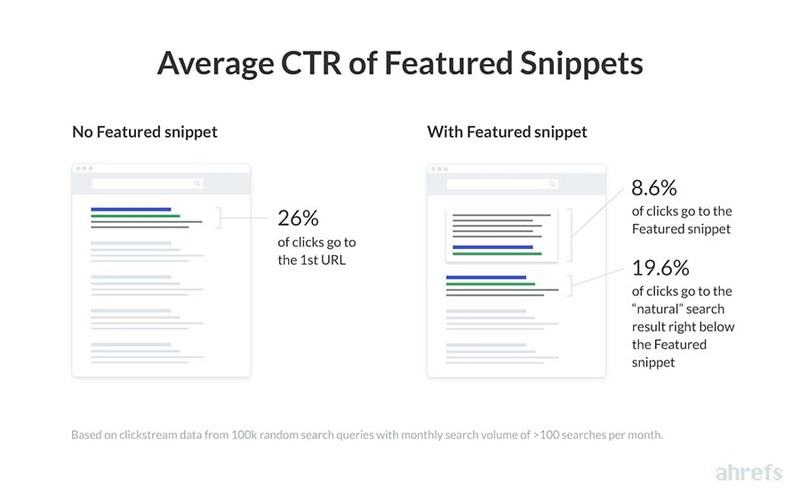 And SEO professionals are absolutely excited about this new opportunity because featured snippets give a chance for low‐ranking pages to get to the top of search results with almost zero effort. 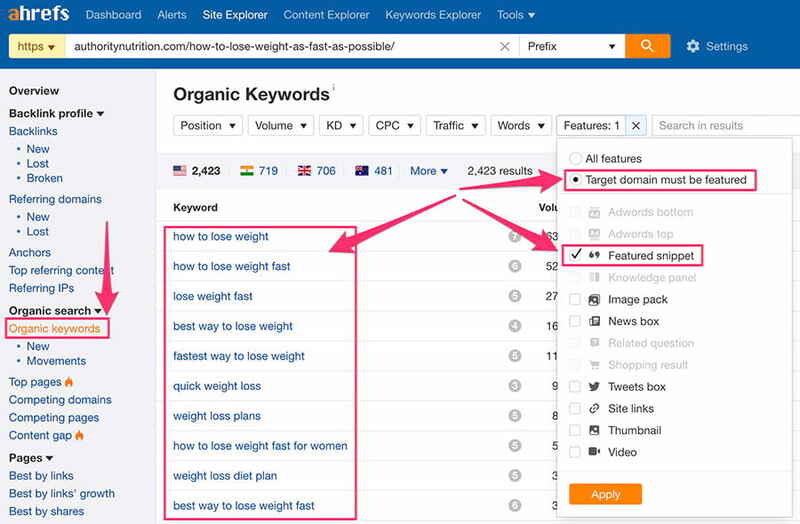 Last year, Ahrefs jumped on this bandwagon by intoducing support for all sorts of “SERP features” in the Site Explorer and Keywords Explorer tools. And today, we have collected enough data to carry out a substantial research of featured snippets and share all our findings with you. A Featured Snippet (otherwise called Answer Box) is a brief answer to a user’s search query, which is displayed on top of Google search results. It is extracted from one of the top‐ranking pages for that search query and includes that page’s title and URL. But that was my own definition. You might also want to know how Google themselves describe it. What makes a featured snippet so enticing? If your page is ranking anywhere in the top10 Google search results, it has a chance to also get the #0 spot — a featured snippet. And the best part is that the amount of effort required to get featured is almost zero (that is, if you get lucky). I mean, let’s say that you rank #7 for some keyword. Trudging your way to #1 would usually be quite challenging and slow. But if there’s a featured snippet opportunity, you can get there almost instantly with just a few small adjustments on your page. 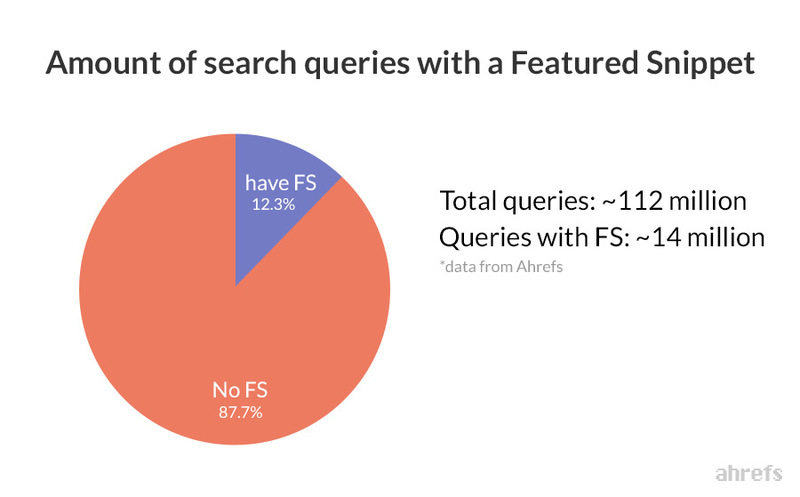 So let’s see what Ahrefs’ data tells us about featured snippets and how to take advantage of this awesome opportunity. 1. How many search queries have a featured snippet? When we performed this study, we had ~112 million keywords in our US database, almost ~14 million of which had featured snippets in their SERP. 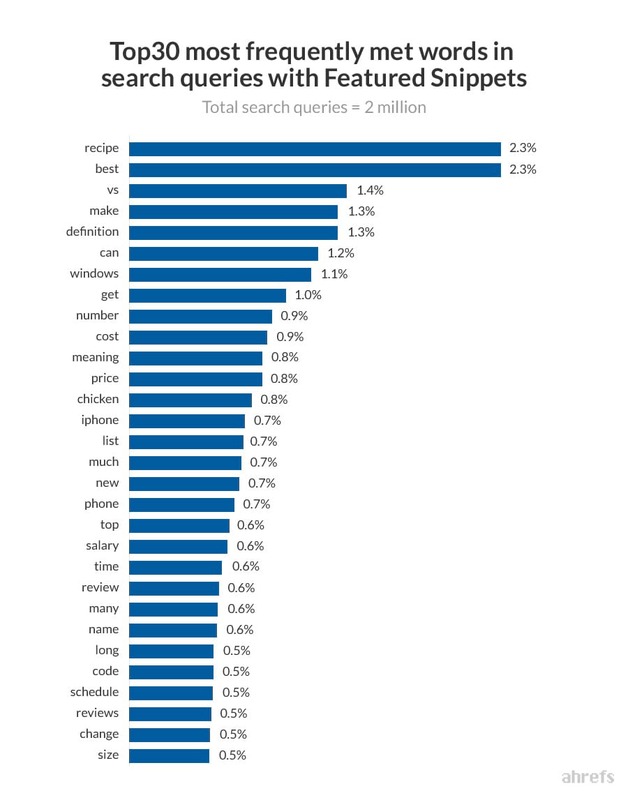 Performing a study on 14 million keywords would be rather challenging, so most of the experiments below are based on smaller samples (up to 2 million keywords, depending on the experiment). 2. Do featured snippets drive more clicks? Featured snippets are styled differently from the rest of the search results. They occupy more real estate, and they clearly catch the eye. So they should attract a lot of clicks, right? When there’s a featured snippet at the #1 position, it only gets ~8.6% of clicks (on average), while the page that ranks right below it will get ~19.6% of clicks (on average). How does it compare to a regular #1 ranking page with no featured snippet above it? That page will get ~26% of all clicks. In other words, it looks like the featured snippet is stealing clicks from the #1 ranking result. Just in case you want to know a bit more about the details of the above experiment, we only selected search queries that didn’t have any paid ads, and we excluded all branded search queries where the #1 ranking result had sitelinks. Sample size: 100k keywords with search volume of at least 100 searches per month. So we also decided to study the “Clicks‐to‐Searches” ratio for keywords that had a featured snippet in the search results VS those that didn’t. 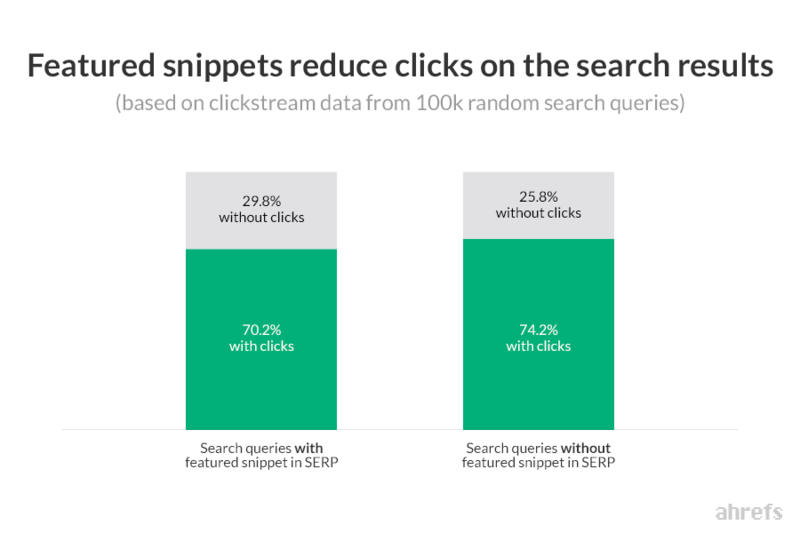 It looks like featured snippets do reduce the overall number of clicks. 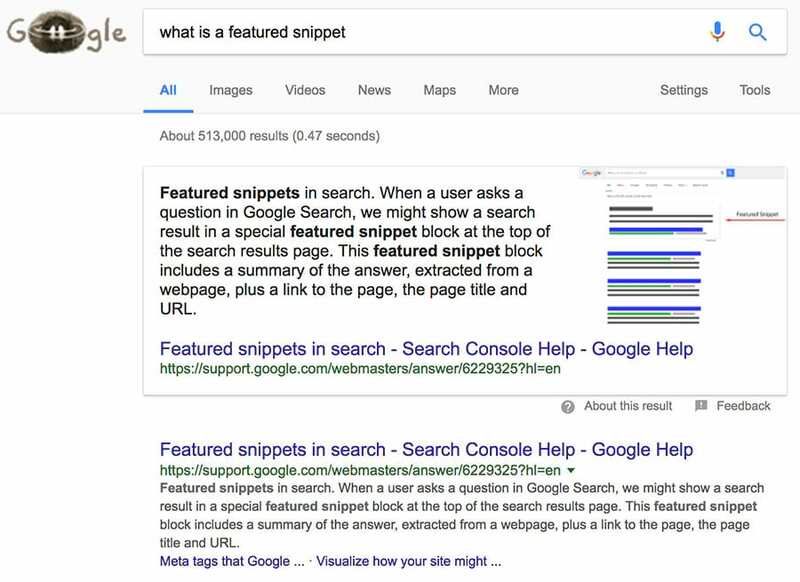 Which is no surprise, actually, since the goal of these featured snippets is to give the searcher an instant answer to their question so they wouldn’t have to click. Please treat the results of the above experiments with a grain of salt because featured snippets aren’t the single contributing factor to both CTR and Clicks/Volume ratio of a search query. And the numbers vastly vary from keyword to keyword, while we’re giving you averages across a large sample. But the general takeaways do seem to make a lot of sense nonetheless. 3. 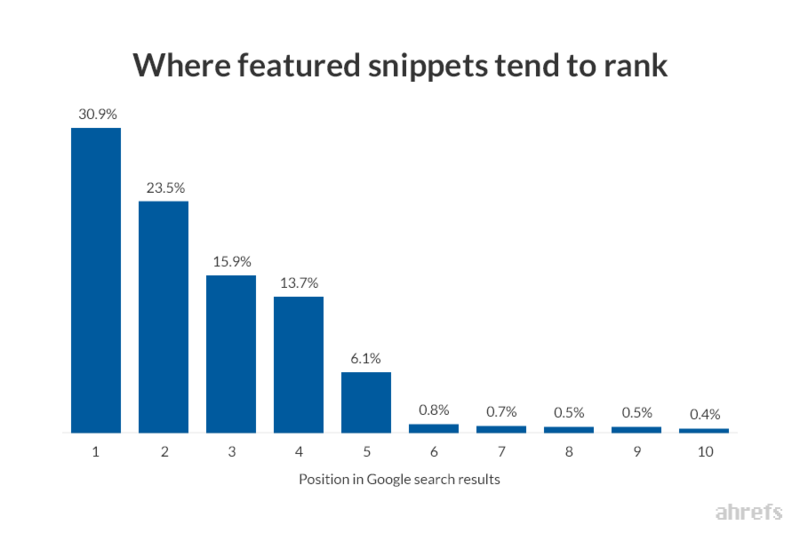 What are the most common ranking positions of featured snippets? In the above experiment, we only looked at the search queries where the featured snippet was ranking at the very top of the search results. But how often does this occur? It looks like only 30.9% of featured snippets rank at the very top. And still, the vast majority of them rank in the top5 quite consistently. 4. Is top10 ranking required to get “featured”? According to our data, it is 99.58% positive that Google only features pages that already rank in the top10. But now you’re probably wondering what’s up with these 0.42% “outlier” pages? The answer is simple: they are taken from some other SERP feature, like an Answer Box. So it appears there’s no way to rank in a featured snippet if you don’t already rank anywhere on the front page of Google. 5. 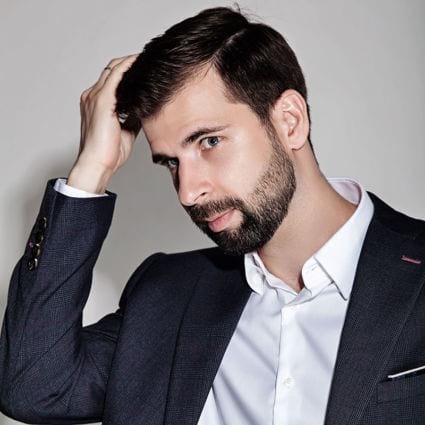 Do backlink signals help you get a featured snippet? 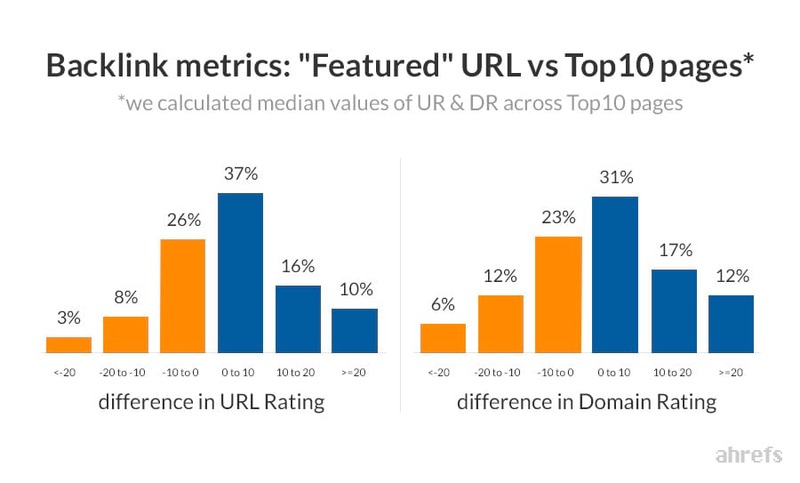 For each individual search query, we compared the backlink metrics of a “featured” page vs. median value among the rest of the pages in the top10 organic results. In the vast majority of cases, the backlink metrics of a “featured” URL seem to be on par with the rest of the pages in SERP. So Google doesn’t seem to be featuring “the strongest” page in the top10. DR & UR only measure the overall quality and quantity of incoming backlinks. We didn’t study the anchor texts of these backlinks, or surrounding text, or topical relevance of the linking pages. So we can’t advise you to discount all backlink factors at once. 6. How many featured snippets can a single page rank for? The top‐performing page in our database owns 4,658 featured snippets! 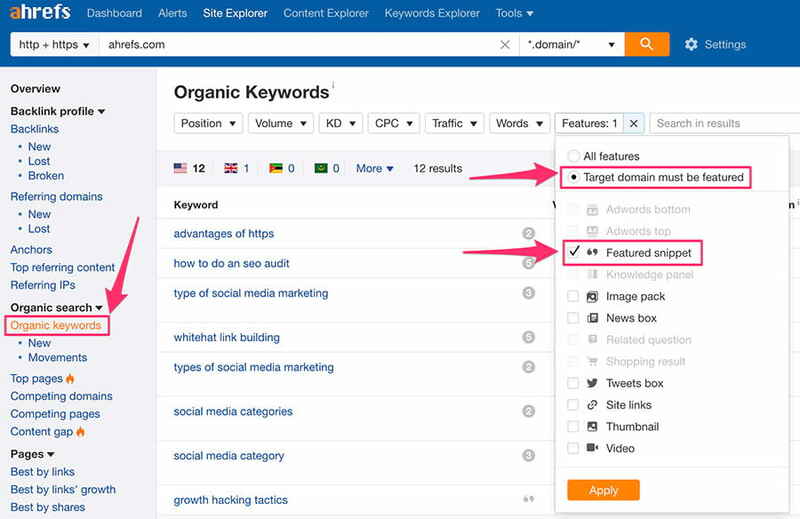 You can browse the search queries where this page is featured using Ahrefs’ Site Explorer tool. 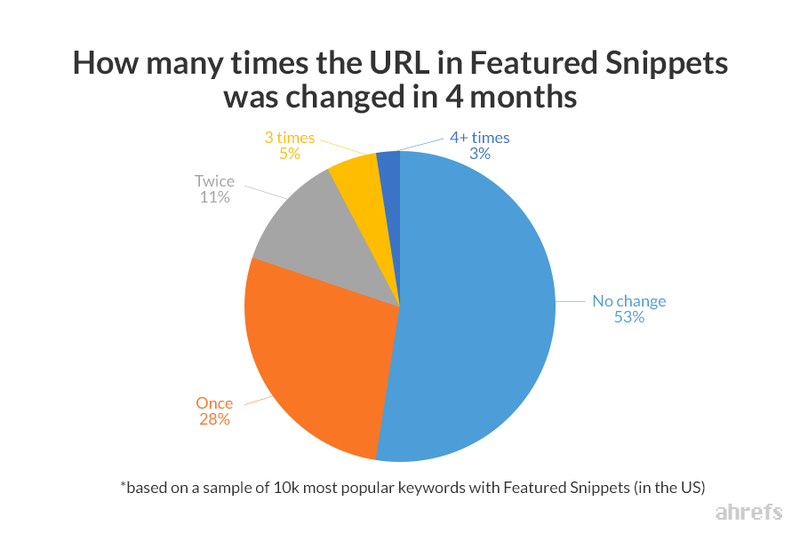 Do you want to get the Top100 URLs by the number of featured snippets? We’ve pulled the list from our database and you can download it here (no opt‐in required). We already know that a single page can rank in the top10 for thousands of relevant keywords (see our previous study). But it turns out that a single page can also “be featured” for thousands of search queries. 7. Which search queries trigger featured snippets? Let’s take a closer look at the 2 million search queries with featured snippets that we have randomly selected for this study. Somehow, I always thought Google only cares to display a featured snippet if the keyword is fairly popular. But it turns out the majority of featured snippets are triggered by long‐tail keywords. This data actually supports the “create great content” mantra. 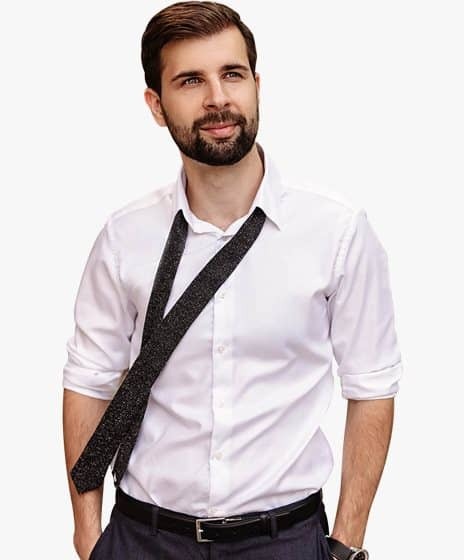 I mean, there’s almost no way you could purposefully target millions of featured snippets for millions of long‐tail keywords. 8. Which words trigger featured snippets? A.J. 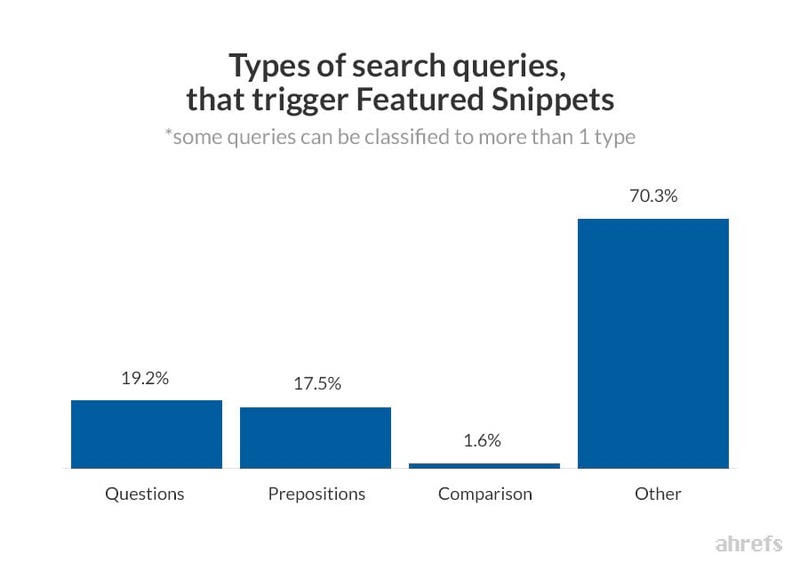 Ghergich has done some great research, studying the relations between types of search queries (questions, prepositions, comparisons) and formats of featured snippets (paragraph, table, list). To my sincere surprise, the vast majority of keywords that trigger featured snippets didn’t belong to any of the three aforementioned groups. 9. Which websites get “featured” most often? I’m sure you won’t be surprised if I say that Wikipedia is the absolute leader in the amount of featured snippets it owns. But can you guess the top20 “most featured” websites in the United States? Do you want to get the Top1000 websites by the number of featured snippets? We’ve pulled the list from our database and you can download it here (no opt‐in required). Research these websites with Ahrefs’ Site Explorer and learn from their success. I don’t know about you, but I was rather surprised to see YouTube as the #7 “most featured” website. I mean, you do get a large Knowledge Graph panel with a video in it when you search for some YouTube video (like a Katy Perry song). 10. How often does Google change featured snippets? This one was quite tricky to study because we don’t update SERPs for all keywords in our database with the same frequency. The more popular a keyword is, the more often we update it. Which means that longer tail keywords might not have their SERP updated in 2–3 months. I hope you enjoyed our takeaways and now have a much deeper understanding of Google’s featured snippets. How do you rank in a featured snippet? Unfortunately, there’s no guaranteed way to do it. But there are quite a few things you can try to increase your chances. We have a full guide to finding and stealing featured snippets here. 1. Secure the featured snippets that you already own. The odds are your website ranks in a few featured snippets already. 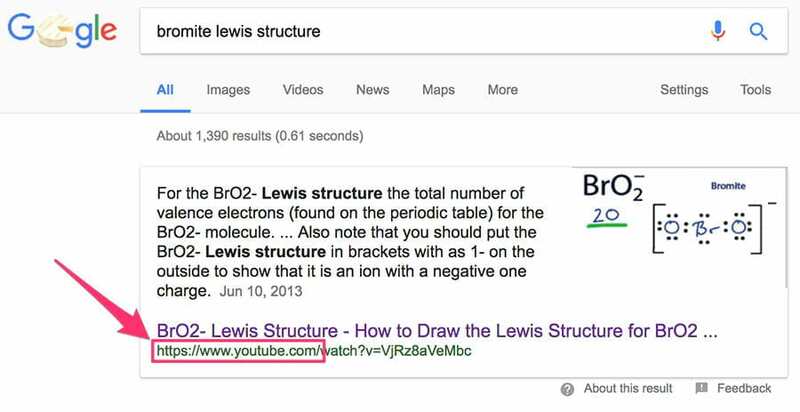 If you don’t want someone else to steal these featured snippets away from you, you have to make sure that each of your featured snippets perfectly matches its search query. Match your content to the current format of the snippet (paragraph, list, table, image). 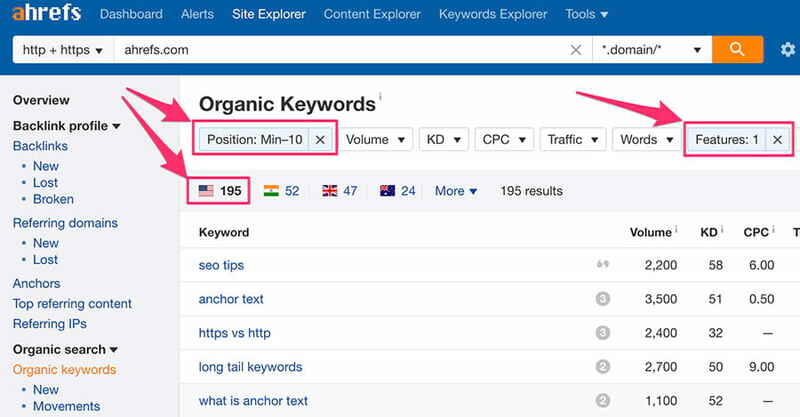 Here’s a great post by Richard Baxter that shows this strategy in action: Optimising for Google’s Quick Answer Box. 2. Look for existing opportunities. The key to winning these snippets from your competitors isn’t in any way different from what I just suggested. You just have to “feed” Google a better snippet than what’s already listed. Some people have reported that using structured markup helps to get featured. At first Google confirmed it, but immediately after they said otherwise. We noted that the code snippet of itemtype=”http://schema.org/ appeared on 15.7 percent of featured snippet URLs, but we saw the same markup on 19.6 percent of regular search result URLs. 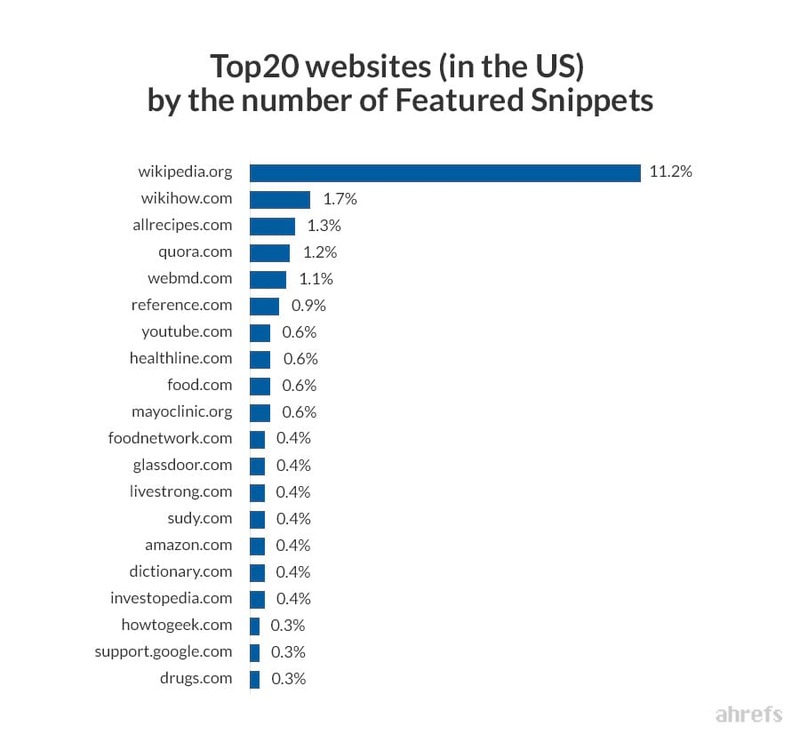 Wikipedia was the number one domain for featured snippets in our data set and they don’t use Schema.org, which may have skewed our results here. triggered by search queries that aren’t categorized as questions, comparisons or prepositions. 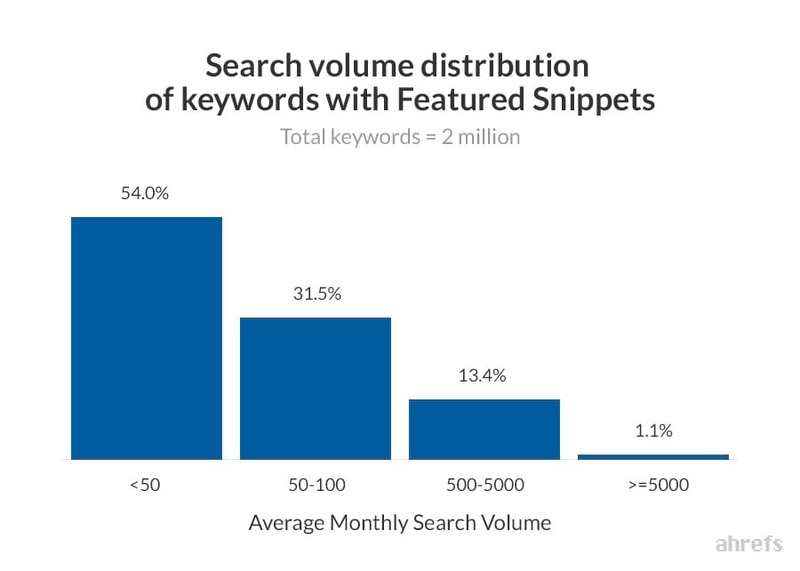 This means that the best way to rank for a lot of featured snippets is simply to produce a lot of great content that will address what people are searching for. And, of course, formatting it in a way where it would be easy for Google to pull featured snippets from it. That’s all we can tell you about featured snippets as of today. I hope you enjoyed our data and I encourage you to “steal” it for your own articles, presentations and client proposals. As always, if you would like us to study something else about featured snippets, don’t hesitate to let us know about it in comments. We’ll see what we can do.